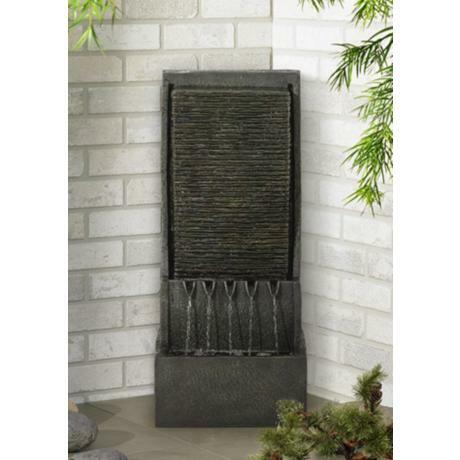 Dark and contemporary, this fountain features a wall of stone that leads to five spouts of flowing water. 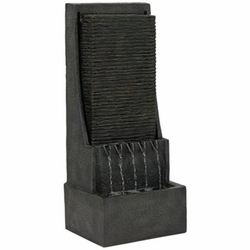 Bring the soothing sounds of water to either your indoor or outdoor spaces with this stunning fountain. Featuring a wall of stone that leads to five spouts of water that flow into a lower basin. Great for porch or entryway areas. Easy to place with included power cord; simply add water, plug in and enjoy! • Faux dark stone finish. • For both indoor or outdoor use. • Includes pump, 5 1/2 feet of cord.